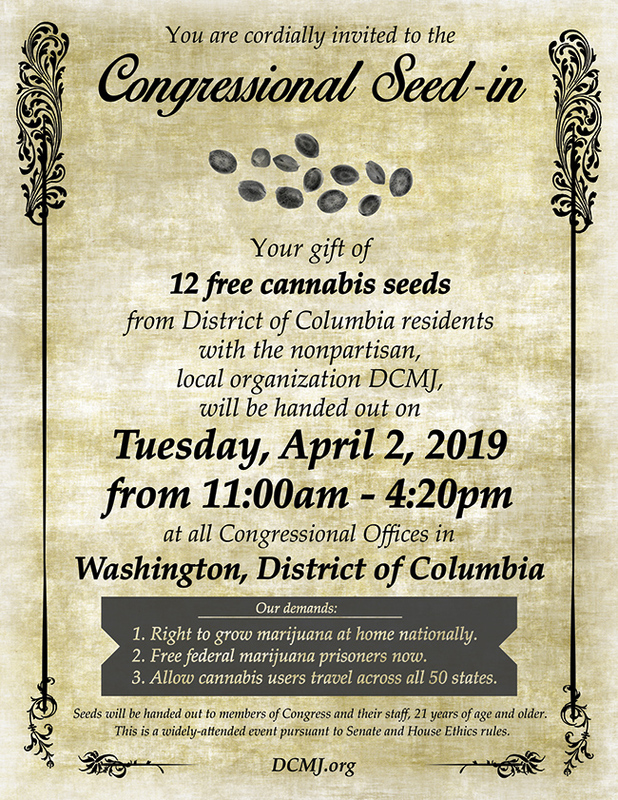 WASHINGTON, DC – On Tuesday, April 2, 2019, cannabis reform advocates from DC Marijuana Justice (“DCMJ”), Maryland Marijuana Justice (“MDMJ”), and Virginia Marijuana Justice (“VAMJ”) will descend on Capitol Hill to lawfully give away cannabis seeds to members of Congress and their staff, 21 years of age and older. The action is to call for cannabis consumer-friendly legislation that permits adults to grow cannabis in the comfort and privacy of their homes & backyards. “As full legalization & descheduling of cannabis approaches cannabis consumers & medical patients must be able to travel throughout the United States without fear of arrest, detainment, or harassment,” says Dawn Lee-Carty, Founder of Speak Life, a mom and founder of Speak Life, an organization dedicated to educating parents and legislators on the benefits of cannabis. Ms. Lee-Carty came to advocate the use of CBD, a non-psychoactive chemical compound found in cannabis, and THC after pharmaceuticals failed to adequately treat her epileptic 11 year old daughter. Due to the federal prohibitions on cannabis, Ms. Lee-Carty cannot travel with her daughters medicine. After voters in the District of Columbia approved Initiative 71 in November 2014 and Congress approved the law in February 2015, all adults aged 21 years of age or older can legally grow & possess small amounts cannabis in the District of Columbia. With the annual spring planting taking place after the last frost in late April, the “Congressional Seed-In” aims to help members of Congress and their staff lawfully start their cannabis gardens in the District of Columbia. Outdoor cannabis requires cannabis to be grown in cycle with the seasons, so a timely spring planting is integral to the success of the crop. However, not every American is afforded the right to grow their own cannabis. Instead many Americans are forced to buy their cannabis from dispensaries, which costs as much as 10 times more than home grown cannabis. “The only legislation we see in the 116th Congress moving is backed by lobbyists to deal with business interests,” says Adam Eidinger, Proposer of Initiative 71 . “We’re going up to the Hill to encourage members of Congress and their staff that they represent more cannabis consumers than cannabis businesses. We want to legally grow cannabis as a basic right and this is frankly more important to me than access to banks or tax reform for huge marijuana businesses,” adds Edinger. WHY: Citizens demand meaningful legislation that fully ends prohibition cannabis cultivation for every adult and allows the movement of cannabis between all States. “I don’t want cannabis grown using nuclear or coal power. I want it grown using natural sunlight. The current system of using costly warehouses to grow cannabis plants under synthetic light using synthetic chemicals is bad for consumers and bad for the environment. There is a better way,” says Ms. Lee-Carty, who currently grows using LED technology, but would prefer to grow her daughter’s cannabis outdoors..
“The age of utilizing expensive warehouses to grow cannabis is a relic of prohibition and DCMJ & MDMJ believe that cannabis should return to the fields from which it was formerly grown,” says MDMJ co-founder Kris Furnish. “Congress and state leaders have been standing in the way of cannabis consumer friendly reform, while poll after poll show that the American public fully supports the full legalization of cannabis, including home grow. Since its founding in 2013, DCMJ has lead the nation in creative and high-profile cannabis reform activism. After introducing and passing ballot initiative 71, which legalized the possession and cultivation of cannabis in the District of Columbia, DCMJ organized two large seed giveaways that provided all adults the means to grow cannabis for themselves. Since then DCMJ has deployed giant 51’ inflatable joints outside the White House, the Democratic National Convention in Philadelphia, Times Square in New York City, the 2016 Presidential Debates, and Boston’s Freedom Rally, as well as distributing over 10,000 joints of District of Columbia home grown cannabis at the Inauguration of President Donald Trump to most recently, attempting to distribute 1,227 joints at the congressional “Joint Session” in 2017, where U.S. Capitol Police unlawfully arrested seven DCMJ activists. All charges were dropped the following day. The “Congressional Seed-In” is DCMJ’s fourth annual “Reschedule 4/20,” day of action to highlight the need for meaningful cannabis reform legislation in the United States. In 2018 and 2019, aligned organizations MDMJ & VAMJ were formed to advocate for cannabis reform in Maryland and Virginia. CLICK HERE TO RSVP ON FACEBOOK! Point By Point Rebuttal of the False Accusations From Congressman Andy Harris. Thank you for taking the time to respond to my inquiry. Unfortunately, the information you provided had no sources or references, so I was able to find a vast array of reliable studies and surveys that provided contrasting data to all of the alleged negative impacts of marijuana legalization. First, a study from Kent University states that there is no concrete evidence that strict marijuana laws deter young people from using or abusing cannabis. Based on analytical data from 38 countries, Alex Stevens concluded that when a more theoretically relevant group of respondents was used to re-apply and re-analyze data from the Health Behavior in School aged Children Survey, there was no statistically significant association between policy reform and higher odds of adolescent cannabis use. While people with a family history of psychotic disorders or that have experienced childhood abuse have a greater possibility of developing psychosis due to cannabis use, there is still only a very small percent of the population that is susceptible to these disorders, and more importantly, being familiar with genetic indications of psychotic disorders outweighs any added effect of cannabis use. Furthermore Harvard Medical School performed a recent study of cannabis related to schizophrenia in which Dr. Delisi concluded that a genetic predisposition is necessary, meaning that cannabis does not cause schizophrenia by itself. Since the state of Colorado passed Amendment 64 in 2012 and enacted the legislation in 2014, annual marijuana use among teens has decreased in adolescents aged 12-17, according to two surveys performed by the Colorado Department of Public Health and the Behavioral Risk Factor Surveillance System. In addition to Colorado, jurisdictions such as Maine, the District of Columbia and California also have statistics that show a decrease in marijuana use among youth ages 12-17 proceeding the legalization of cannabis. Bhandari, Smitha. M. D. “Marijuana and Schizophrenia: Is There a Link?” WebMD, WebMD, 22 Nov. 2018, www.webmd.com/schizophrenia/schizophrenia-marijuana-link#1. Carey, Benedict. “Does Marijuana Use Cause Schizophrenia?” The New York Times, The New York Times, 17 Jan. 2019, www.nytimes.com/2019/01/17/health/cannabis-marijuana-schizophrenia.html. Ellis, Lisa. “Medical Marijuana for Schizophrenia: Weighing the Risks and Benefits.” PsyCom.net – Mental Health Treatment Resource Since 1986, www.psycom.net/medical-marijuana-schizophrenia. Miller, Blair. “Kids’ Marijuana Use Flat in Colorado in 2017.” 7NEWS, 19 July 2018, www.thedenverchannel.com/news/politics/share-of-colorado-kids-using-marijuana-stays-flat-in-2017-while-adult-use-increases-reports-say. Newman, Tim. “Cannabis and Schizophrenia: New Evidence Unveiled.” Medical News Today, MediLexicon International, 28 Apr. 2017, www.medicalnewstoday.com/articles/317170.php. Proal, A C, et al. “A Controlled Family Study of Cannabis Users with and without Psychosis.” Current Neurology and Neuroscience Reports., U.S. National Library of Medicine, Jan. 2014, www.ncbi.nlm.nih.gov/pubmed/24309013. Roberts, Michael. “Activist: Falling Colorado Teen Pot Use Stats Hard for Jeff Sessions to Dismiss.” Westword, 4, 14 Aug. 2018, www.westword.com/news/colorado-teen-marijuana-use-falls-in-federal-study-9782555. Salley, Mark. “Marijuana Use in Colorado Rises for Adults, Stays the Same for Kids.” Gov. John Hickenlooper | The Official Site of Governor Hickenlooper, 19 July 2018, www.colorado.gov/pacific/cdphe/marijuana-use-2017. Stevens, Alex. “Is Policy ‘Liberalization’ Associated with Higher Odds of Adolescent Cannabis Use? A Re-Analysis of Data from 38 Countries.” NeuroImage, Academic Press, 16 Feb. 2019, www.sciencedirect.com/science/article/abs/pii/S0955395919300210?dgcid=author. Wright, D. SAMHSA Center for Behavioral Health Statistics and Quality, and RTI International. “National Survey on Drug Use and Health: Comparison of 2014-2015 and 2015-2016 Population Percentages (50 States and the District of Columbia).” Stages of Community Readiness | SAMHSA,www.samhsa.gov/data/sites/default/files/NSDUHsaeShortTermCHG2016/NSDUHsaeShortTermCHG2016.htm. ANNAPOLIS, MD USA — The hearings for SB0383 and SB0771 in the Maryland Senate will take place on February 26th, 2019 at 12 P.M. noon at the James Senate Office Building in Annapolis, MD. Senate Bill 0383, introduced by Senator Cheryl Kagan, (D-17) would allow law enforcement to obtain medical cannabis at no cost, not be subject to arrest or punishment under certain circumstances, and also grants many other benefits to law enforcement obtaining and using medical cannabis for the purpose of establishing a program to study the effects of intoxication as it relates to impaired driving. SB0383 provides advantages to law enforcement without preferential treatment to our nation’s veterans, that have been negatively affected by the war on drugs, and would still be subject to arrest for the possession of cannabis under Maryland state law even if this bill passes. SB0771, introduced by Senator Will Smith (D-20) would legalize, tax and regulate the adult use and cultivation of cannabis in April of 2020. While this bill allows for the cultivation of up to 4 plants by an individual over the age of 21, there are very precise restrictions surrounding the visibility of cannabis plants in a cultivators residence. These provisions do not allow for plants to be publicly visible, and also require that the plants be locked and not accessible to persons under the age of 21, but does not include any exemptions or exceptions for medical youth patients. Although these bills enact more regulations regarding cannabis, the specific guidelines within them have potential to continue the injustices we have seen perpetuated by the failed war on drugs. “We want to make sure that the counties aren’t shafted by the tax revenue generated from legalization” said Alfred Dawson of MDMJ. Mr. Dawson adds, “Our representatives know that this issue is important to their constituents, and with the right laws in place, everyone can benefit”. 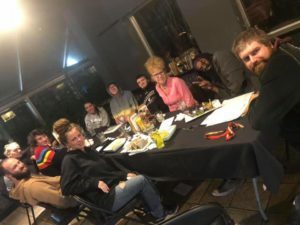 In addition to the two bills in the Senate, members of MDMJ, Maryland NORML and others united under the banner of the Maryland Cannabis Policy Coalition raised awareness of two bills in the Maryland House of delegates that also pertain to the legalization, taxation, and regulation of cannabis. 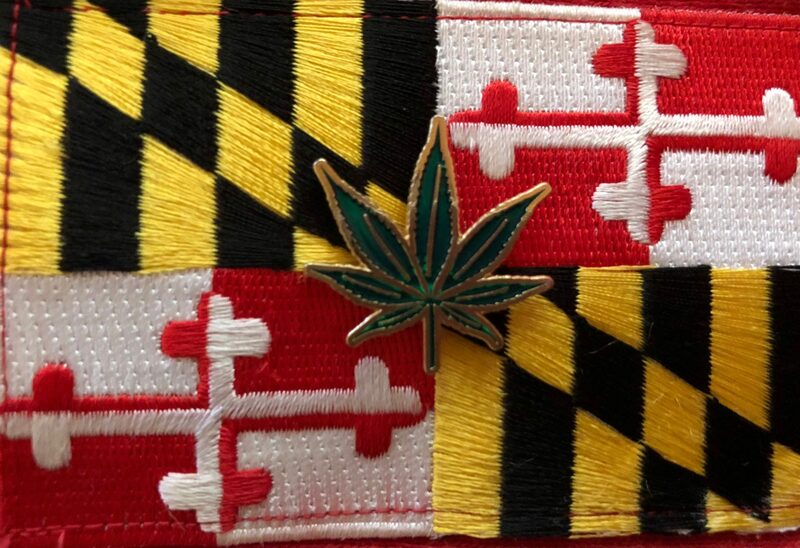 HB0632 introduced by Delegate David Moon (D-20) would amend the Maryland State constitution to put the question of legalizing marijuana on the November 2020 Presidential election ballot. While this bill allows for the most democratic approach to legalization, it also has the potential for voter suppression or other factors to negatively influence the results. The alternative approach is HB0656 introduced by Delegate Eric Luedtke, (D-17) the jointly related bill to SB0771, which would enact full scale legalization of cannabis in April of 2020, but also has to be approved by a super majority in both houses of the General Assembly (85 votes) in order to avoid veto by incumbent Republican Governor Larry Hogan, who has openly opposed the legalization of cannabis for adult use. The hearings for the two House bills will take place at the Maryland House of Delegates Chamber on March 6th at 1 PM. Maryland Marijuana Justice is an organization dedicated to fighting for cannabis users, growers and their families in the free state. Thank you for contacting me regarding your thoughts on marijuana. As a physician and a member of the Doctors Caucus, I appreciate you sharing your thoughts with me regarding this very important issue. I understand that marijuana used specifically for medical reasons can result in positive outcomes. For example, in Colorado, Charlotte’s Web, a THC-free strain of marijuana,reportedly reduces seizures among persons suffering from epilepsy. While I support efforts to cure and treat disease, I strongly believe that just like every other medication made available to the public, medical marijuana should be subjected to the FDA for rigorous testing to assure that there are not adverse health risks. However, marijuana is also the most commonly used illicit drug in the world, including in the United States. In 2016, an estimated 8.9% of individuals in the United States aged 12 or older used marijuana in the past month. The rate of reported marijuana use in 2016 was significantly higher than those rates reported prior to 2007. Mirroring this increase in use, the supply of marijuana in the United States has also increased. This growth has been linked to factors such as certain states’ legalization of recreational marijuana, rising marijuana production in Mexico, decreasing marijuana eradication in Mexico, and increasing marijuana cultivation in the United States led by criminal networks including Mexican drug trafficking organizations. As a physician, I have serious concerns about the potential impact of legalizing recreational use of marijuana. Legalization in the United States and elsewhere has resulted in documented increases in drug abuse, especially among children and teenagers. Marijuana use literally changes a teenager’s brain structure; diminishes memory, attention and IQ; leads to learning and behavioral problems and poor school performance; and contributes to symptoms of depression, anxiety, psychosis and schizophrenia. Furthermore, studies show that legalization of “pot” leads to drastic increases of use among young people, with usage increasing more-than-two-fold higher than national averages. 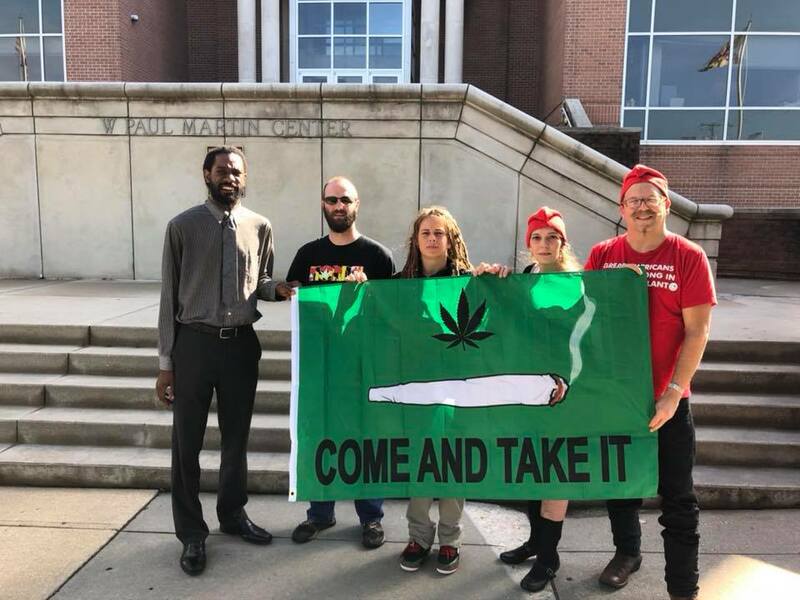 SALISBURY, MD – On Tuesday, October 2, 2018, Salisbury University progressive student activist Jake Burdett attended a medical marijuana protest against Congressman Andy Harris organized by Maryland’s new cannabis advocacy group Maryland Marijuana Justice (MDMJ). At the meeting inside the Congressional office that resulted from the protest, Mr. Burdett briefly livestreamed one of Harris’ staffers without his permission, which Mr. Burdett did not realize was a felony – or even illegal in the state of Maryland at all. Mr. Burdett deleted the livestream the following day after he found out his recording was illegal, but Congressman Harris dropped the hammer on Burdett to try to make an example out of him by deciding to press felony charges. Although Mr. Burdett is pleading guilty and he has personally apologized to Congressman Harris’ staffer, he did not realize the nonconsensual livestream was against Maryland’s “all-party consent” law at the time. “Is it unreasonable for a 20 year old to think that it’s legal to record a staffer of a United States Congressman in a public space? In a society that supposedly values transparency in government, I do find it odd that Jake can be found guilty of the ‘crime’ of recording the staff of elected government representatives in a taxpayer funded space,” says MDMJ Co-Founder Kris Furnish. “Mr. 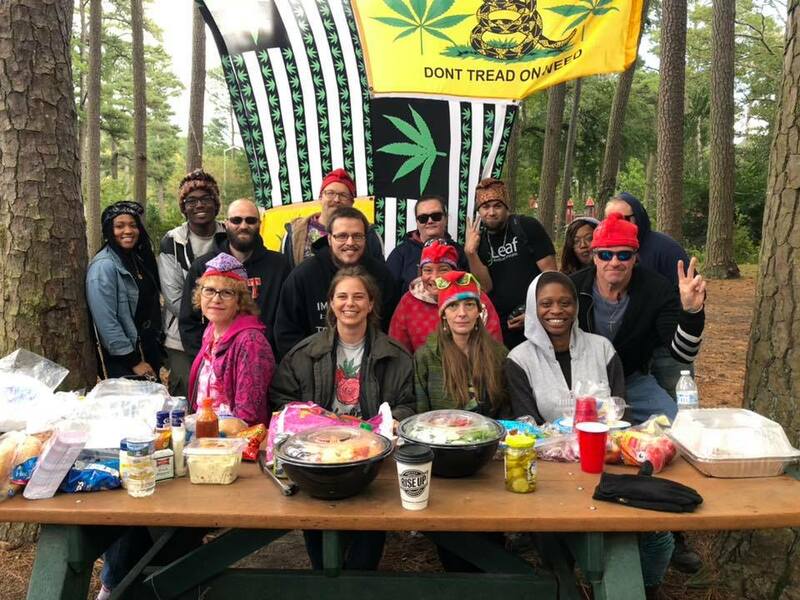 Burdett’s plea, which will take place on March 1, in Wicomico County, and Harris’ slew of prior racist scandals, should not distract from the original issue that brought me and other advocates to the protest in the first place – the legalization of cannabis,” says Furnish. “Rep. Harris wants to pretend to be victimized by a 20 year old’s deleted livestream, while he supports the racist war on drugs that actually victimizes thousands of people a day by locking them up for the victimless crime of smoking marijuana, a non-addictive substance with many medicinal benefits. Rep. Harris is a medical doctor, so I’d think he of all people would recognize the medicinal benefits of marijuana, and how it could be used as an alternative to pharmaceutical drugs such as painkillers, which are an epidemic in Rep. Harris’ district right now. We can’t help but wonder if Rep. Harris’ seemingly irrational opposition to legal marijuana has anything to do with the $42,200 he’s accepted from the pharmaceutical lobby in the 2017-2018 election cycle, which vehemently opposes any form of marijuana legalization,” concludes Furnish. Please complete this form to register for participation in the Maryland 2019 Cannabis Legalization Lobby Day. One form must be completed for each registrant using the address listed on their Maryland Voter Registration card (or where they intend to register to vote). 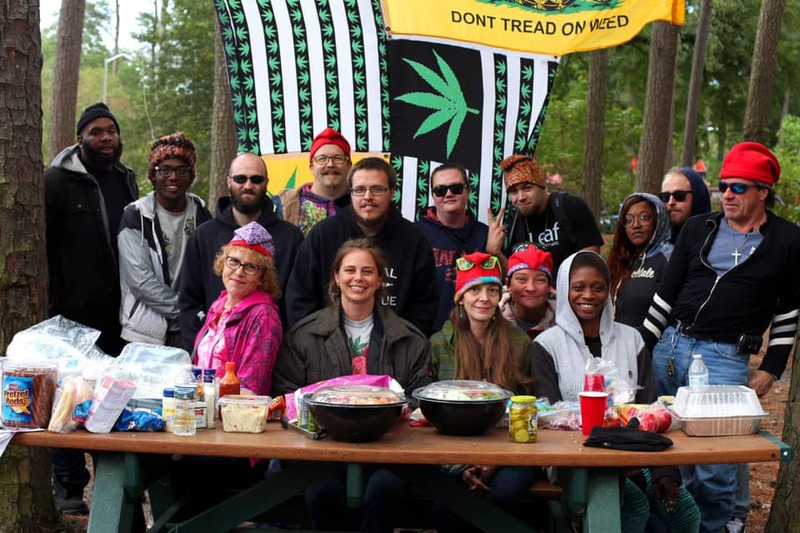 Maryland NORML calls on all who support legalizing responsible adult cannabis use in Maryland to register for the most impactful event of the 2019 legislative session! The purpose of this lobby day event is to demonstrate that the citizens of Maryland are ready for the General Assembly to hold a vote on Cannabis legalization during the 2019 General Assembly Legislative Session; we want to touch base with as many members of the Maryland General Assembly as we can. We request that you provide your voter address when you register, allowing us to match you with a scheduled meeting time with your General Assembly representatives in the Maryland State Senate and House of Delegates. We request that all registrants allow us to schedule appointments with their respective General Assembly representatives rather than contacting legislators directly. This will help us match registrants with previously scheduled meeting times and avoid legislators continuing to receive phone calls after meetings have been scheduled. Once you register, you will receive a registration confirmation email with additional information, including your legislator meeting times. Prior to meeting with your elected officials and/or their staffs, we will provide you with an information package prepared specifically for you. This information package will contain your scheduled appointment times/locations, suggested talking points for your specific representative(s), copies of legislation we are promoting, and other important materials. Share & Spread the Word! Join us this Friday as we kick off the New Year and the new congress with effective strategies for lobbying in February. Create letter to deliver to local delegates for support for several issues surrounding marijuana legalization. We will be in the back in the “Game Room” at Roadie Joe’s. Just ask a server to walk you there if you have trouble finding us. We hope to see some new faces at the meeting, so feel free to bring your friends/family along with you. We want to see this organization grow, so please, spread the word, and let’s get to it! Please join us on January 22nd at the District Court of Maryland for Wicomico County for AJ’s jury trial court date. After multiple appearances, AJ finally gets to go before the judge with a jury present to plead his case for marijuana possession along with other charges. We need members of the community to come support AJ as he pleads his innocence against these false and unjust charges. We desperately need cannabis reform, and this case is a prime example of why. It is unjust to arrest people for a plant. However, it happens everyday. We must fight the system to change it’s laws regarding cannabis. After everyone has cured themselves of election fever by casting their votes on November 6th, it’s time to shift the focus back to why we started this organization: CANNABIS REFORM! Join MDMJ for our fifth meeting being held at Roadie Joe’s Bar and Grill on November 13th from 6:00 P.M. to 7:30 P.M. to recap election results, and discuss AJ’s second court date on November 14th. Please RSVP to this event on Facebook. 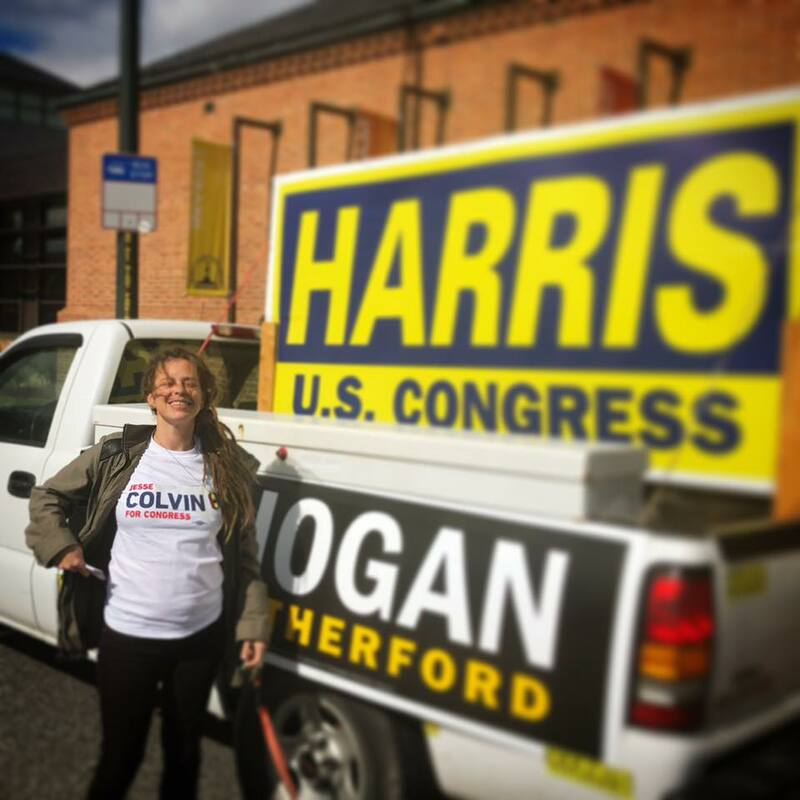 Over two weeks ago, we announced our plans for two demonstrations at Congressman Andy Harris’ offices to highlight his callous attitude toward cannabis as a treatment for opioid addiction. As the sponsor of the budget rider that prevents the Council of the District of Columbia from legislating on cannabis reform, we have, on numerous occasions, both in person and in writing, sought a meeting with Congressman Harris to discuss why he continues to tyrannically stymy common-sense cannabis reforms in the District of Columbia, Maryland, and across the nation. Harris has refused to meet with medical cannabis patients because he takes money from the pharmaceutical industry that would rather push pills than a plant. At approximately 12 noon today, Tuesday, October 2, cannabis reform advocates gathered outside of Congressman Harris’ District of Columbia office at 1533 Longworth House Office Building. As advocates were making their way toward the Congressman’s door, he was walking down the hallway in the opposite direction and made a bee-line towards his office. 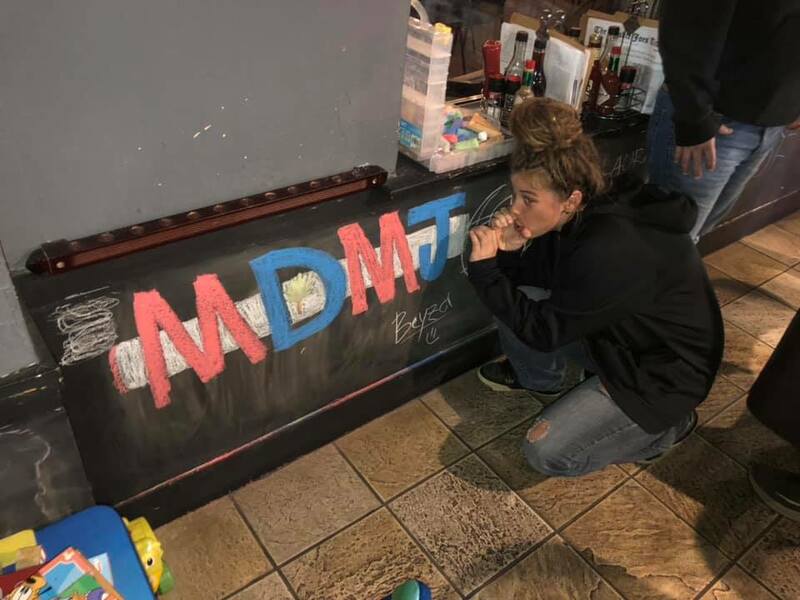 DCMJ volunteer, Rachel Ramone Donlan, whom Congressman Harris promised he would talk to in person about cannabis reform, asked to speak with the Congressman and followed him to one of the entrances to his office. Instead of acknowledging her and fulfilling the promise he gave to her at his August 10 town hall meeting in Salisbury, Maryland, Congressman Harris slammed the door on her face. She tried to open the door only to find Harris had locked the door. Ms. Donlan then walked toward the other entrance to Congressman Harris’ office and his staff slammed the door on her leg. Ms. Donlan is disabled and suffers Ehlers-Danlos Syndrome, which is a genetic connective tissue disorder that causes her intense pain. She consumes medical cannabis in order to stay off addictive prescription drugs. After the door caught her foot, she proceeded to go on with the planned demonstration and used her medical cannabis in the hallway to help mitigate the physical pain caused by Harris and his staff. At no time was there any assault on the Congressman, rather the Congressman and his staff assaulted cannabis reform advocates instead of attempting to hear why they were at his office in the first place. Any bruising to the Congressman’s wrists was self-inflicted and not caused by Ms. Donlan. She weighs approximately 90 pounds and is about 5 feet tall and is spending tonight in jail due to Harris’ continued callous attitude toward cannabis reform.